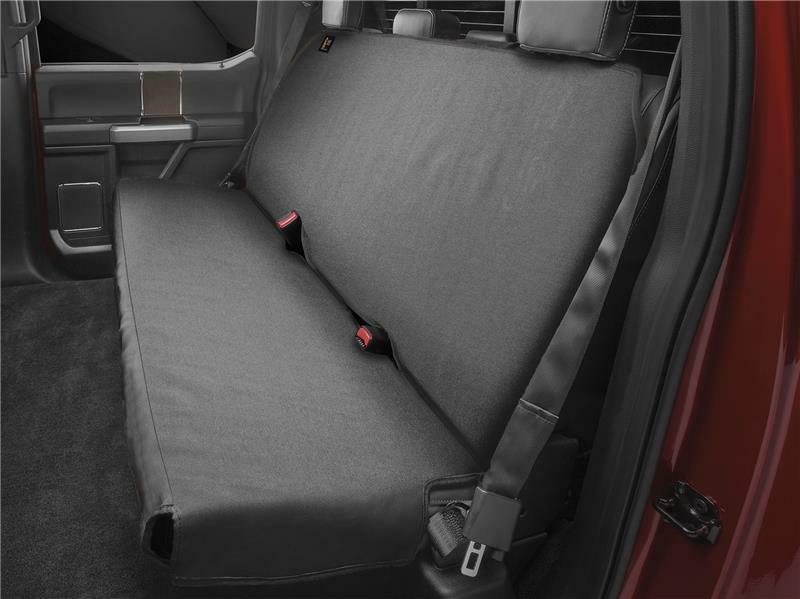 WeatherTech Seat Protectors are the perfect accessory for those vehicle owners needing an extra step of protection for their rear vehicle seating. A much needed accessory for the family “road trip warriors” or pet “car ride” companions to prevent scratches, damage or spills from ruining the seat surface. The Seat Protectors are made from a polycotton drill fabric that features a durable water-repellent finish that’ll combat any juice box spill, cereal crumbs or pet mess! It’s also engineered with an extra layer of nylon lining, which helps to further protect the covered seat. The Seat Protector stays in place with the help of durable straps, specialty inserts and a non-slip bottom. Semi–custom to fit the size and type of vehicle. Quick and easy installation, as well as easily removable for cleaning. The Seat Protector is machine washable, making it an easy accessory for any family. This product is for rear seats only – It is designed to fit most bench-style rear seats and will not fit rear bucket seats. Additionally, if your vehicle is equipped with a center seatbelt, it will not be accessible. Available in black, tan and grey.